Sofitel is about to launch a new exclusive sale for 40% off of Best Flexible or Premium rate and for triple Le Club Accorhotels members. This sale is available for bookings 7-days only between October 7 to 14, 2013, for stays from November 18 to March 31, 2014. Some hotels may have blackout dates and/or minimum stay requirement that are disclosed on the PDF above. You normally earn 4% of your room rate back in Le Club Accorhotels points at full service Accor hotels. If you are Le Club Accorhotels Platinum members, you will earn total of 16% of your room rates back in points when you book this sale rate (4% base, 4% Platinum bonus and 8% promotional triple points). The sale page doesn’t mention the triple points aspect but this page does. You can access Softel’s web page for this sale here. 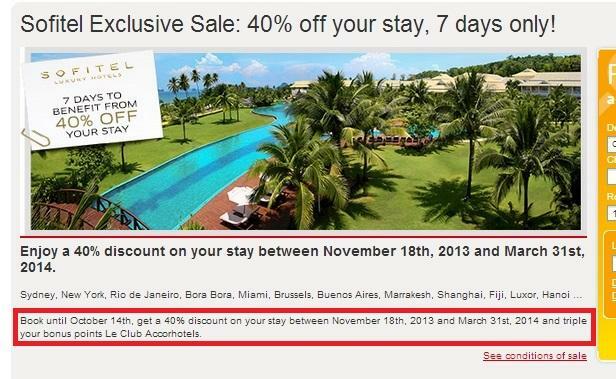 Sofitel hotels are always excluded from Accor’s regular sales. I guess that they want to keep the Sofitel brand more “exclusive”. I am not sure if Accor Advantage Plus members are eligible for their additional 10% off of these Sofitel sale prices. Offer is subject to availability at participating hotels and is valid for bookings made on http://www.sofitel.com/gb/private-sales/index.shtml between 7/10/2013 and 14/10/2013, for stays between 18/11/2013 and 31/03/2014 inclusive. The 40% reduction per night is calculated on the basis of the Premium rate (or the Best Flexible Rate for hotels that do not have the Premium Rate). This offer is for accommodation only. The offer is for physical persons only and is limited to 7 rooms per booking. The offer does not apply for groups (more than 7 rooms). The offer cannot be combined with any other special offers or advantages. The pre-payment by credit card of the full amount of the stay will be debited at the time of reservation. The amount pre-paid is not reimbursable. Reservations can not be modified, canceled or exchanged. Among participating hotels, some properties require a minimum stay of 3 nights. Moreover, some blackout dates apply.